Aeration is the naturally occurring process of air exchange between the soil and its surrounding atmosphere. Practically speaking, aeration is the process of mechanically removing small plugs of thatch and soil from the lawn to improve natural soil aeration. It’s commonly called “core aeration” in the lawn service industry, and you may have heard of it as soil cultivation (coring, spiking and slicing). Most homeowners simply call it aeration. The type of aeration equipment can determine how effective the treatment will be. In general, turf responds best when core holes are close and deep. Equipment with hollow tines removes soil cores. Most lawns benefit from annual aeration. Heavily used lawns, or those growing on heavy clay or sub soils may need more than one aeration each year. Again, turf responds best when tine spacing is closer and penetration is deeper. If you have cool season turf grass such as Kentucky bluegrass and perennial rye grass, both spring and fall are ideal times to aerate. In spring, aerate between March and May. Perform fall aeration between August and November. Aeration before or at the time of late season fertilization enhances root growth and improves spring green-up and growth. Warm season turf grasses such as zoysia grass and Bermuda grass should be aerated in mid-spring to summer. Avoid aerating when warm season grasses are dormant – it may encourage weed competition. In addition, avoid aerating warm season grasses during spring greenup, and not until after their first spring mowing. 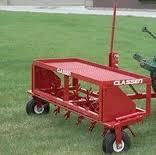 We use Classen Stand on Aerators. What is this benefit? They are much heavier and pull good core plugs even in a dry, hard packed yard. With adjustable hydraulic powered tines we can set the depth of plug we want. We always get good results. Our machines pull plugs while the other guys just bounce around your yard! Click on the picture above to watch the video. Got a large yard or propery? We can do that to. We have 3 point hitch aerators that will work great on your property. No slit cutting here...its true core aeration.